Photograph shows group shot of unidentified women snowshoeing, one of three photos mounted on page with caption "Snow Shoeing - 1923." Photograph shows group shot of unidentified women snowshoeing, one of five photos mounted on page with caption "Snowshoeing Winter 1923." Photograph shows group shot of unidentified women snowshoeing, one of three photos mounted on page with caption "Slide on Seine River." Date of photograph is probable, [1923?]. 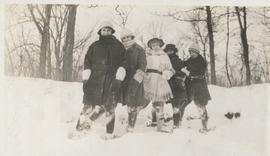 Photograph shows group shot of unidentified women snowshoeing, one of three photos mounted on page with caption "River Park - Winter 1923." Photograph shows group shot of unidentified women with snowshoes, one of three photos mounted on page with caption "Snow Shoeing - 1923." Photograph shows group of six unidentified people standing in deep snow in foreground, one of five photos mounted on page with caption "Snowshoeing Winter 1923." A photograph of the formal gardens at Kildonan Park. Date of photograph is August 12, 1970. A photograph of the formal gardens at Kildonan Park. Date of photograph as stated on verso is July 15, 1971.